having a ready insight into and understanding of things. I think it’s pretty much given that Kandi Steiner has established herself as an author who has this tremendous gift in storytelling. In all honesty, she slays you with her lyrical prose, flawed characters, and raw emotions. So after reading my first Steiner book, A Love Letter To Whiskey, in which I highly recommend, I instantly became a fan of this author. If you have read my review, then you are well aware that this book knocked my literary world off it’s axis as I rated this book as one of my top ten reads of last year. I didn’t think Steiner could top A Love Letter To Whiskey, as it was absolutely brilliant and poignant but I was wrong. 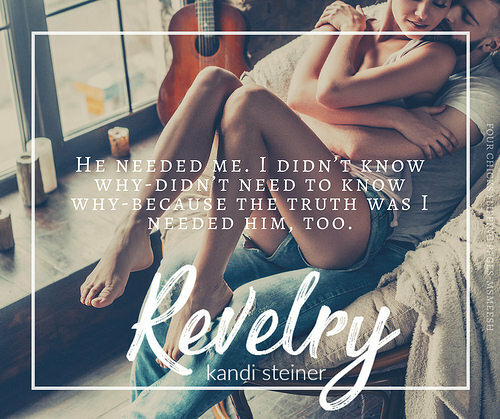 In her newest release, Reverly, Steiner once again held me hostage with her words. I reveled and drown with her characters as their brokenness and vulnerability coursed through my veins. Revelry is one those stories that grips you right off the opening pages. The raw honesty and vulnerability of the heroine, Wren Ballard consumed me. Wren is twenty-seven years old and recently divorced. After leaving a ten year relationship, she is free. If you are thinking she must have had a physical abusive relationship, that is not the case. Wren will always love her ex-husband. He was a big part of her life but after several years into the relationship, things began to change. They drifted apart. Her love for him changed. And before she could resent and hate him and lose herself completely, Wren made the biggest decision of her life. To leave and be free. Call it selfish or what not, it was something she had to do in order to find and love herself once again. So when Wren decided that she needed to get away for the summer, she decided to rent a cabin in a small town outside of Seattle. In this summer cabin, it is there Wren reflects on her life. The choices and the path that led her to this point in her life. As the new girl in a small town, it was quite inevitable to stay hidden as one neighbor inserted herself into Wren’s life. As Momma Von introduced Wren to the neighbors, she was also introduced to Anderson Black. Anderson is a broken man. He revels in his guilt and grief. He blames himself for the death of his baby cousin. Seven years has passed and it seems Anderson can’t seem to let go of the guilt and sadness. It consumes him to the core hence leaving no room to love completely. That is until, he saw the eyes of Wren Ballard. A woman who also had sadness in her eyes. Two broken and damaged individuals. Yes, Wren and Anderson were those two passing ships in the night that collided. A collision awaiting to happen. As Wren and Anderson danced around their attraction to one another, they soon found themselves wanting and needing each other. As they both opened layers and layers of scars, regrets, guilt, and sadness to one another, they began to drown in each other’s warmth. Those broken and shattered pieces slowly began to get pieced back together. A once broken heart afraid to love began to love again. A soul filled with guilt and remorse finally began to break free of it’s chain. But what happens when reality sets in and Wren must return back to her life in Seattle, will she be able to walk away from Anderson? They say love is kind but it also can be selfish. Is it wrong to be selfish when it comes to love? And the answer to that can only be answered by you. Love is just a word. Four letters. That’s it. L-O-V-E. Yet, the definition of love is something that is hard to explain. But what can be explained is that love gives meaning. And for Anderson Black, Wren Ballard is his definition. She gives love meaning. A purpose. And that can also be said for Wren as Anderson is her second chance at love and life. This story. These characters. These words. These emotions that Kandi Steiner had coursing through my veins are the very essence of why I love her books. Revelry is a prime example of a love story that showcases that love is truly indeed a journey. There is no right or wrong way. The roads may be bumpy, smooth, or full of twist and turns. It is a path that anyone is willing to take and venture out for. It may take days, months, or years to get to the final destination of happiness and peace. And for Wren and Anderson, this journey of love, peace, forgiveness, and truth began when two broken souls mended each other’s brokenness. So if you are looking for a story that weaves passion, love, truth, and understanding then I highly recommend you to revel and get lost in the words of Kandi Steiner. The writing was lyrical. The story was poignant, beautiful, heartfelt and unforgettable. All there is left to say, go read this book and of course, I think it’s fitting if I end this review with a word of the day. begin or cause to begin again. 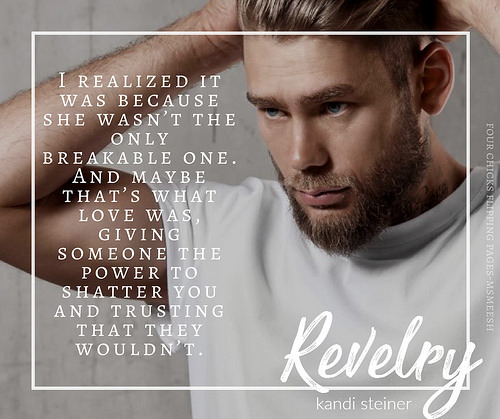 Revelry is beautiful and a tearjerker. Wren and Anderson were electrifying. Wren spent a lot of time finding herself..the best part is, she not only found herself but the love of her life. Anderson was quiet and didn’t want anything to do with ever loving or trusting anyone. He was all about taking care of himself and always finding things to fix. But she never really realized that what he was doing wasn’t enough, until he met Wren. Wren was everything he thought he didn’t deserve. She was a woman full of hope and happiness waiting to come out. Wren was looking for her muse and with Anderson he found so much more. Their story was full of love and hope for the present and future. There were times that they really pulled my heart strings, that I couldn’t stop the tears from falling. They were two people who needed love and found it within each other. I love them both and I hate Wren’s ex-husband, all he did was pull her down and stomped on her emotions. I really love this second chance romance in unlikely places. I will definitely read more from this new to me author Kandi Steiner.